Traditional marketing is dead. Or at least, it should be. You get the point. How would you feel after a phone call like that? Unless your refrigerator was actually broken and you were in the market for a new one (when’s the last time you shopped for a fridge? ), you would likely feel pretty annoyed. But this is how the traditional marketing machine works. It’s interruptive and attempts to push products or services on customers. Traditional marketing, or as some now call it “Outbound Marketing”, isn’t limited to just cold-calling like the example above. It includes any similar tactic where the company is attempting to push their message OUT (far and wide) like trade shows, direct mail, email blasts, and even print (or online) advertising. The hope is that the message resonates with that needle in a haystack. This type of marketing is not only costly, the ROI is relatively low, or can’t be measured at all. There has to be a better way, right? In the last few years, technology has completely changed the game in terms of how people discover, research and buy products and services. Today, buyers are now much more in control of the information gathering and decision making process. Sales people are no longer the gatekeepers of information. By 2020, customers will manage 85% of their relationships with a company without talking to a live person. The smart marketer recognizes and understands these trends and adapts their marketing tactics to capitalize on this behavior. They strive to deliver the right (marketing) message, to the right person, at the right time. Enter Inbound Marketing. Inbound has existed for some time, we just didn’t call it that, exactly. Forward thinking digital marketers who used a combination of marketing channels - most commonly content marketing, SEO, social media and email - to try and attract a customer’s attention were "doing Inbound" before it was called Inbound. "Inbound marketing is focused on attracting customers through relevant and helpful content and adding value at every stage in your customer's buying journey. With inbound marketing, potential customers find you through channels like blogs, search engines, and social media. Unlike outbound marketing, inbound marketing does not need to fight for potential customers attention. By creating content designed to address the problems and needs of your ideal customers, you attract qualified prospects and build trust and credibility for your business." HubSpot coined the term “Inbound Marketing” in 2006, and they are the power behind the inbound movement. There’s even a stand-alone conference dedicated to Inbound, now in it’s 7th year. Incidentally, as a certified HubSpot Partner agency, we will be attending the Inbound conference this year. There are two key concepts at the center of Inbound Marketing. The first is the Inbound Methodology, which we will cover in detail below. The second is the Buyer’s Journey, the process buyers go through to become aware of, evaluate, and purchase a new product or service. This is a three-step process. The graphic below illustrates a sample buyer’s journey for the simple purchasing decision of a doctor visit during an illness. 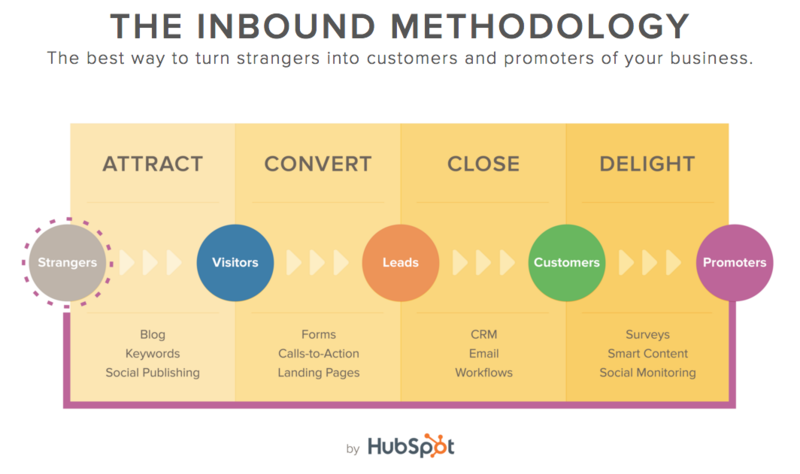 HubSpot deems the inbound methodology as the the best way to turn strangers into customers and promoters of your business. Here we examine each of the four stages of the methodology and specific tactics that can be deployed at each stage. We don’t want just any traffic to our site, we want the right traffic. 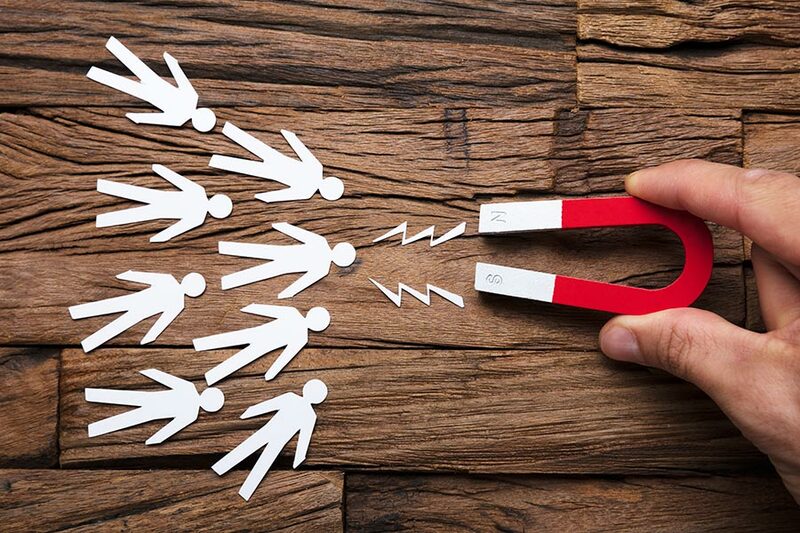 We want the people who are most likely to become leads, and, ultimately, happy customers. How do you get them? You attract more of the right customers with relevant content at the right time – when they’re looking for it. Content Strategy. Your customers begin their buying process online, usually by searching to find something they have questions about. So, you need to make sure you’re showing up when and where they search. To do that, increase your presence with tools that help you define and implement your content strategy. Do your target customers actively research products before buying them? In other words, is the act of buying your product a “considered buying process”. Is your organization open to sharing insights, and teaching your prospects about issues related to your product or service, even if this means competitors can see this content? What is the lifetime value of your customer(s)? Adopting an inbound approach requires a level of investment that just may not be realistic if customers generate less than $500/year for your business.